Beverly Fishman creates powerful abstract paintings that address technology and the pharmaceutical industry. Fishman lives and works in Detroit, where she teaches painting at the Cranbrook Academy of Art. She spent a sabbatical in New York last year, and late in the summer I had the opportunity to visit her in her studio. Fishman spoke at length about drugs, systems of dependency, and the insidious nature of healthcare in America. While I had prepared to discuss her geometric abstractions, her candor came as a surprise. The country’s current discourse on healthcare give her paintings particular significance. We remain one of the few industrialized nations without universal healthcare. With the election of Donald Trump, Republicans stand poised to repeal the Affordable Care Act. Furthermore, many American citizens take a cocktail of prescription and illicit drugs to simply feel normal. Fishman is a painter with the concerns of a sculptor, making paintings that require high levels of production. Her studio practice includes manufacturing uniquely shaped supports and consulting with automotive paint specialists to get the background she needs to achieve industrial finishes. Fishman’s solo exhibition “DOSE,” curated by Nick Cave, opens Thursday at the CUE Art Foundation in New York, where it is on view through April 5. JASON STOPA Your paintings are rooted in the formal language of high modernism, but they have titles such as Depression (2016) and Opioid Addiction(2016), which suggest something more quotidian than the lofty ideals espoused by Barnett Newman or Josef Albers. There is no sign of your hand. They are rather impersonal paintings, though the themes indicated by the titles—pharmaceutical drugs and addiction—are quite personal, which creates a disconnect between the titles of the work and their appearance. Do you see them as subversive? BEVERLY FISHMAN Yes, I intend for my paintings to be subversive—but I don’t see them as only subversive. I want you to think about the seductive nature of the pharmaceutical industry as well as the purist and transcendental language of high modernism when you look at them. Both can be dangerous. The pharmaceutical industry creates medical issues to sell us more drugs than we need. High modernism can overemphasize autonomy and art’s separation from the world. But while I am suspicious of both these entities, I reject neither drugs nor the modernist tradition. Pharmaceuticals help millions of people. And though I may disagree with certain modernist ideals—for example, the purity of the medium, or the radical separation of abstraction from representation—I’m still taken with the abstraction of Stella. I don’t really see Stella as making transcendent paintings in the way that I think that Rothko or Albers made paintings that create an experience of a realm or a state beyond everyday experience. Rather, I love Stella’s literalism and the impact that his work has had on the development of painting. To me, he’s important because of the formal and conceptual boundaries that he’s pushed. I always ask myself how I can surprise myself with my paintings, and keep my studio alive and fresh by making work that synthetizes form, color, and social content in dialogue with tradition. My solution is to begin with representation and very direct references to the body and the world. All the shapes of my wall reliefs with urethane paint are appropriated from actual pills that I have found images of online, and the cuts in their surfaces correspond to the score marks that allow these drugs to be divided into smaller doses. Thus, although they look abstract, my paintings are tied to problems like attention-deficit disorder, opioid addiction, anxiety, and depression. Their forms connect them to the social problems of today. STOPA When I visited your studio last fall, I was struck by your use of materials. The high-finish automotive paint produces an uncanny surface. You also use irregularly shaped supports, rounded corners, and convex and concave vignettes. The resulting works mimic the industrial nature of your subject matter. How did you arrive at this way of working? FISHMAN I began with the idea of the allure of pharmaceuticals. Everything—the forms, the materials, the idiosyncratic colors, and the way of handling the surfaces—came from this concept. I started by researching shapes online, then made a series of collages exploring different color combinations using a wide range of materials. I use paint sample cards acquired from home supply stores, color swatches, and fragments of vinyl signs to create mixtures of different color systems, both natural and synthetic, which are then realized in automotive paint. While the forms evoke pills, many of the colors refer to skin tones, either with fleshy hues or with pigmentation associated with makeup. Once I have chosen the final palette, I then have the tablet shapes fabricated in wood and painted by specialists. Then it’s back to looking at the works on the walls of my studio. Since scale affects color relationships, I continue to alter them until they finally surprise me. STOPA You’ve maintained a close friendship with Nick Cave, who is curating your show at CUE. Cave is a sculptor and performance artist working in a variety of mediums. Is there a formal or conceptual thread that connects the two of you? Can you tell me about working with him to put together this exhibition? FISHMAN It’s great to work with Nick. He is a fearless and visionary artist—as well as an amazing mentor and friend. I met him through the Cranbrook Academy of Art when he was a member of our advisory board. He came to my studio, and we started a friendship that has lasted for years. Since the first time I met him, I have felt strongly connected to Nick—I think because he is an artist first, and because his whole life revolves around his work. Nick pushed and challenged me in ways that have really allowed me to develop the work. He is very discerning and honest. He is also fearless about his own practice. He has been an absolute inspiration to me—not only his drive and intensity, but also the social engagement of his work. 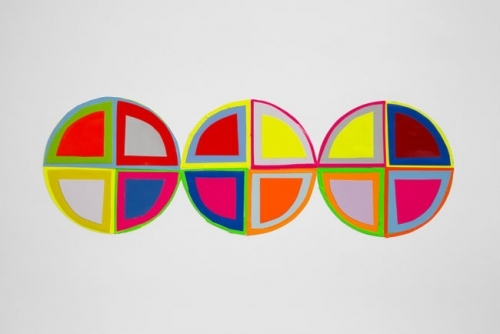 STOPA In the 1980s, artists like Peter Halley and Ashley Bickerton used geometric abstraction to express a rather dystopian vision of a world where art and architecture are co-opted by an oppressive, anti-human apparatus. I don’t see your work as having these same sinister implications, but there is a whiff of it there. You’re part of the generation that came of age in the ’90s. 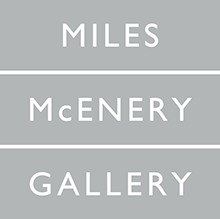 Your works bear similarities to the now-famous “Conceptual Abstraction” show at Sidney Janis Gallery in 1991, which brought together works by Shirley Kaneda, Mary Heilmann, David Diao, Ross Bleckner, and Jonathan Lasker, among others. These artists attempted to distance themselves from Greenbergian formalism by including motifs that were previously off-limits in an abstract painting: external references, illusion, signs, and symbols. Can you talk about your relationship to this legacy? FISHMAN Abstraction has always had a narrative attached to it, I think. From the beginning, there was writing and discourse around nonobjectivity in art that helped to guide its reception and interpretation. I belong to a generation of painters that needed to make the connection between abstract form and external reference more explicit than before—by incorporating texts or diagrams, for example, or by working with simple icons that looked like things in the world. I have known Jonathan Lasker’s work since the early ’90s, and I love his weird and surprising colors. For decades, Ross Bleckner and I have shared an interest in the form of the biological cell as a signifier of identity and disease. And like Peter Halley, I work with abstract forms that I do not view as abstract. Just as he saw squares as referring to cells and prisons, I see very simple geometric forms as—in part—representations of social issues surrounding the use and abuse of specific drugs. I respond to the political content of Peter’s work, and I have also always pursued abstraction in a highly socially engaged way. In the ’80s I was working with the cell as a structure to generate abstract work. However, I was thinking about cells in the biological sense, appropriating medical and scientific images with a color Xerox machine, and collaging these scavenged images together to form mixed media works. But post-painterly abstraction is a very wide discourse. If I have to name important figures with whom I feel in dialogue, I would have to name, first and foremost, Anne Truitt, Judy Pfaff, Elizabeth Murray, Nicholas Krushenick, Carmen Herrera, and Ellsworth Kelly. STOPA I can see the influence of Krushenick and Kelly in your use of Pop colors and shaped supports. You mentioned your interest in socially engaged abstraction. Do you feel yours is an attempt to somehow make an otherwise self-referential mode of painting accessible? How necessary is it for the viewer to understand the content to appreciate the work? FISHMAN I believe that it’s important that the viewer know my content. That’s why I think my titles are significant, because they help to direct people’s readings. On the other hand, even if a viewer comes to my paintings without knowing the concepts behind them, I believe that there’s enough in the works themselves for the spectator to get that they are far from pure. The sleek industrial paint jobs, the sometimes-sickly saturation of hues, the jarring contrasts of natural and synthetic colors—these are formal qualities that, for me, push the paintings in the direction of a critique of geometric abstraction, with its traditional connotations of transcendent aloofness and apartness from life. Throughout its history, abstract painting, even in its most self-reflexive forms, has always found viewers who saw it as referring beyond itself to its social context. In my work, I hope the colors and forms—even if you know nothing about them—evoke a technologically mediated world, one in which our desires are fed by the mass media and our identities are influenced by the products that we consume.